We at Complete Service Work and live in a Community. As members of the community, we hold commitment to protecting our natural resources for this generation and for the ones to come. Below are examples of methods that we have adopted, to ensure commitment to Environmental Responsibility! The First step in environmental security is "Reduction of need"
1. We are 100% paperless by offering all transactions and literature for electronic viewing. All estimates, support documents, and billing are done electronically! 2. We do all material orders on an "as needed basis" to eliminate overruns on materials. 3. We "re-purpose resources" by opting to pay our labor extra time to categorize any extra materials, and clean containers for re-use on future projects. 4. We "opt for materials that are low impact" by using low VOC coatings and materials that are water reducible, eliminating the need for thinners. 5. We reduce need for "fuels" by setting up mobile work sites. All tools and materials stay onsite, allowing the subcontractors and workers to use more efficient transportation to and from work. 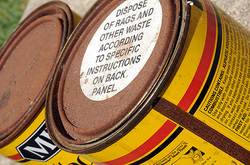 All materials that can be reused, re-purposed, are saved, donated, or stored for future use. this is a list of some items we have, resold, re-purposed on other jobs or donated to be used again. In the few instances that we need to deal with our waste as hazardous, we ensure that it is handled properly. We are professionals so we know how to deal with hazardous materials, but most people don't. The City of Wausau and Marathon County provides these services to home owners and small businesses. Click the link above to find out what these services are and where you can take them free of cost!